Annual. Best grown in average, moderately fertile, well-drained soils in full sun. Tolerates light shade. Tolerate dry conditions. Plant new seed in the garden or in containers each year around the time of the last spring frost date. For earlier bloom, seed can be started indoors 10-12 weeks before the last spring frost date. Will self-seed in the garden where winter hardy (Zones 6-9). Cuphea viscosissima, commonly known as blue waxweed, clammy cuphea or tarweed, is a viscid-pubescent, somewhat weedy, herbaceous annual of the loosestrife family that produces attractive, narrow-tubular, purple to purplish-red flowers from July to October from the upper leaf axils on 10-20” tall purple-tinged stems clad with broad lanceolate leaves. 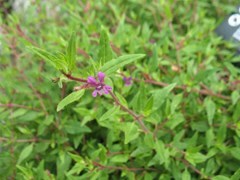 Stems, leaves and flowers are covered with sticky hairs giving rise to the common name of clammy cuphea. This plant is native to open woods, glades, prairies, fields, rocky barrens, roadsides and waste places from New Hampshire to Nebraska south to Florida and Louisiana. In Missouri, it is commonly found throughout the central and southern parts of the State except for the southeastern bootheel area. Flowers bloom singly (sometimes in pairs) from the leaf axils. Each flower (to 1 1/2” long) consists of a narrow tubular purple calyx with 6 tiny purple petals of unequal size (2 long and 4 short) and 12 stamens. Flower width from petal tip to petal tip is only 1/2”. Flowers give way to seed capsules which split open when ripe. Flowers are attractive to hummingbirds and butterflies. Cuphea petiolata is a synonym and former name for this plant. Specific epithet comes from the Latin word viscidus meaning viscid or sticky in reference to the sticky hairs found on the plant. The genus Cuphea contains about 250 species primarily native to tropical and subtropical areas. The within species is the only one that is native to central and northern parts of the U.S. Annual for borders, beds or edgings along walkways or paths. Container plant for decks, patios or porches. Hanging baskets. Houseplant.